The situation: Giants-Brewers, top of the second. Runners on first and second, one out. 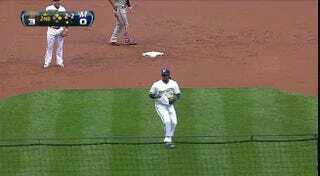 Brandon Crawford bounces one toward Cesar Izturis at short, but a chance to turn an inning-ending double play instead becomes a routine 6-4 putout because Rickie Weeks has a brain fart and thinks he just recorded the final out. Melky Cabrera comes up next and bounces out, so the Brewers get out of the inning unscathed. But Weeks still comes away with something to remember.